Gosh, don’t you just love comfort zones? They are so familiar, so alluring.. Sometimes you have to press up & snuggle against your own boundaries. Put one ear up against the wall & just listen to what could be possible. When I originally started this site, I intended it solely as adult-serious-hoop-bizness territory. But as it (& I) grew, I wanted to stretch out a bit more. Post things from the Zen Apartment, knowledge gems from my psychology studies, …things that are not necessarily hoop related. I needed to remind myself what creates positive spin in my life. The hoop might have assisted in tying all these wonderful things together in a nice big satin bow, but part of my process is recognizing the ‘more’ that is out there. 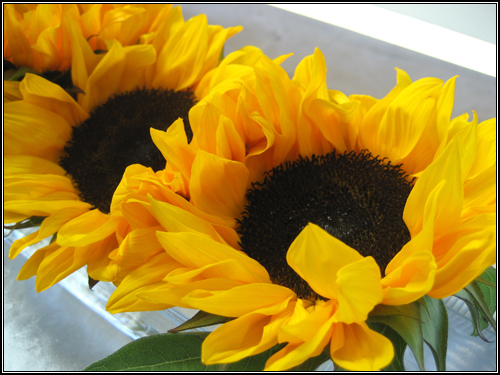 (see: sunflowers) That might include a bit of the ‘downs’ – they are a natural part of my process. Welcome. Help yourself to some chai – there’s almond milk in the fridge. Had feed problems but I figured it out… phew!